I have run across these a few times. They are always on the supply side,, I was wondering how someone would go-about designing a system using them? Is this what is referred to as a "scoop tee"? And I should note that I have NEVER seen any kind of performance data on it, but haven't really looked that hard. In looking at the end profile, it would appear that it affects half the flow, because the diverter sticks half way through the flow path of the tee. I've also seen them on the inlet and the outlet of a high pressure drop fan coil unit. that use the venturi principal on the return side to draw water through the emitters. 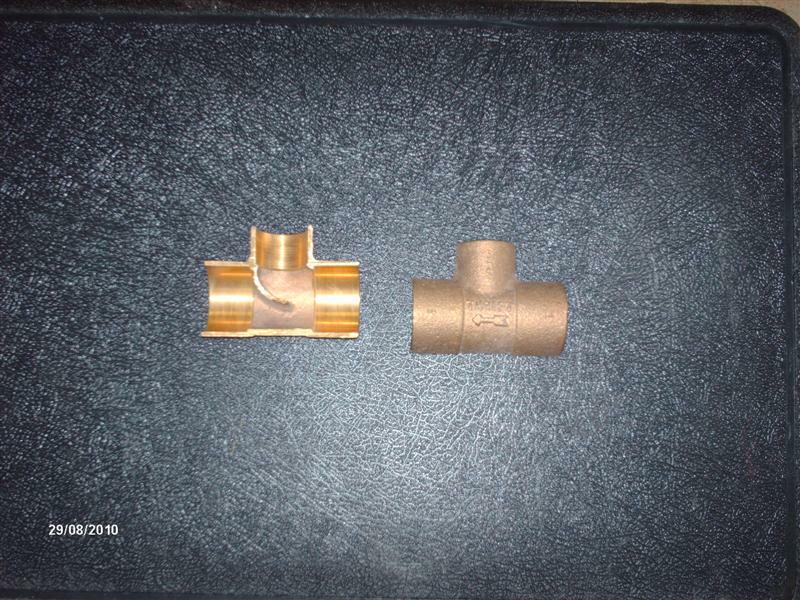 They are also used on the supply in high pressure drop applications. B&G has published the design data for using them... I have the info but it is on paper, not computer file. but I would wonder if the B&G application rules apply to this type. If anyone remembers I posted a cut-away awhile ago,, here it is again. Talk about restriction,,, I guess if one will not work just add another?